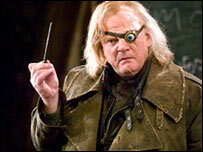 The latest Harry Potter movie, The Goblet of Fire, has received mixed early reviews from critics. It is the fourth film adaptation of JK Rowling's book series and the first to have a UK director - Mike Newell. US entertainment magazine Variety said the "excellent" film was "the darkest Potter yet" with "a climactic scene that does not disappoint". But Screen Daily said the "solid but mostly uninspired" movie only raised "wonder and dread" in its final scenes. 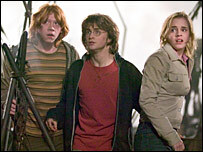 Harry Potter and the Goblet of Fire sees Potter and fellow students from wizard school Hogwarts take part in the Triwizard Tournament, an annual competition involving a series of dangerous challenges. Lead characters Harry, Ron and Hermione - played by Daniel Radcliffe, Rupert Grint and Emma Watson - must also face teenage angst and the spectre of an old villain. 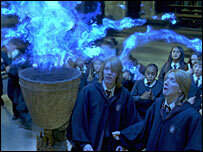 "Film-makers keep the narrative screws fastened tight, which gives The Goblet of Fire an intensity that rarely flags," said Variety reviewer Todd McCarthy. "Newell tries to find the emotional reality in material that, until now, has been used more to showcase fantasy and wonder." Variety said Radcliffe "rises to the occasion with a more dimensional and nuanced performance as Harry" which "suggests for the first time there actually may be an actor in him". It added that the movie was "intense enough" to justify its more restrictive UK and US rating, compared with the movie saga's first three instalments. "Ralph Fiennes makes the series' villain-of-villains a distinctive monster, remorseless and cunning, in a climactic scene that does not disappoint and will, like the dragon, prove frightening to impressionable youngsters," Variety added. The Hollywood Reporter's Kirk Honeycutt called the film "the best one yet", adding that it "feels much more intimate" than the previous offerings. He said the film's handling of the relationship between Harry and Cho Chang (Katie Leung) was "hesitant" but said the confrontation between the young wizard and an old nemesis "does not disappoint". "Newell achieves the same brilliant production values of his predecessors," said Honeycutt. "Along with the brooding and at times ominous look by designer Stuart Craig and cinematographer Roger Pratt, Patrick Doyle contributes the best musical score of the series, one richly symphonic yet with a pop overlay that reminds us we are in a world of fantasy." Writing for The Times website, James Christopher gave the film a positive review but awarded it only three stars out of five. "What's fresh about the Goblet of Fire is the intriguing tension between the feeble and the strong," he writes. "For the first time we sense what makes Harry tick under pressure." He praised Newell's direction, saying: "His considerable triumph is to keep the thrills up to exhilarating scratch." However, the length of JK Rowling's book meant large chunks of the original story have been omitted from the movie. "The Dursleys are sadly missing," said The Times website, "but one can't have everything." But Screen Daily reviewer Tim Grierson was unimpressed. "Harry Potter and the Goblet Of Fire is neither as singular a film as director Alfonso Cuaron's third instalment nor as kid-pleasing as Chris Columbus's first two entries," he said. "The new feature is unlikely to enjoy the same strong reviews as its predecessor, but will benefit from a voracious and large fan base - despite the darker tone and higher certificate ratings." Screen Daily said Newell "feels more confident than his predecessors with Hogwarts' British humour" but "is not wholly successful at juggling the book's myriad new characters, subplots, and tonal changes". "Unfortunately for a film that runs longer than two-and-a-half hours, it's a bit of a slog to Goblet's strongest material, which resides in the last 45 minutes or so." In her BBC News website review, entertainment reporter Keily Oakes said it was "certainly darker" than previous instalments and that the confidence of its lead actors had "grown with age". "Newell has created a polished movie. It will delight existing Potter fans, but, like the later books, it could be too hard for a new audience to follow the complex storylines this far into the series," she said.